the internet, goodness knows I’m all over snapchat (pushyspence) and frequently update my insta, but I haven’t shared much on here. It’s not due to my lack of interest in taking pictures (maybe writing though) or of the clothes I put on my body, I just think what I have been doing, I am growing tired of. I honestly applaud bloggers who have been creating quality content, consistently for years and years – that is hard work and dedication. The thing is, this is not my full time job. Yes, I do make money off of brand partnerships every so often, and I am currently working with a wine brand that has been taking up a lot of the time I would spend creating content for this space, but I also work a full time job as a clothing buyer, 8 hrs a day, usually 5 days a week. I often find myself too tired before or after work to want to shoot stuff for this space, or I would rather spend time hanging with friends and going on adventures. But, it’s Summer, maybe once the cold season hits things will feel different in that respect. Although I haven’t been posting much, I have been taking a lot of pictures…just not really of me. Zach has been taking pictures of me, however, but they are generally one offs and get shared to my insta only. That’s the short of it, I guess. I definitely do not want to abandon this space, I guess I’m just looking to change it a bit since I clearly have not been feeling inspired to share anything here. I still remain passionate about blogging and taking pictures, and sharing my outfits and makeup and adventures, but I look at all of that a little differently now and I want this space to reflect that. I know it sounds rather vague, and to be honest, I’m not sure what I’m looking to change, really. I just hope you remain patient with me. I will always come out with quality content, that is something I will always give you, even if it is few and far between for the time being. These images were shot by Zach yesterday at Marmora Mine. Zach had been before with a friend and I was v jealous, so I told him thats all I wanted to do for my birthday. The Mine is so vast and filled with the bluest water I have laid my eyes on in a long while. It is very much trespassing to go beyond the fence that encases the mine, but clearly that did not deter us. Bad! We didn’t get caught, but I cannot promise you that will always be the case. I have a ton more images that I shot from our day spent there, so I’ll be sure to share those and talk more about this amazing place. Take pictures of dust bunnies in your flat or your toes, we don’t mind. Just stay with us! Your posts are so inspiring. 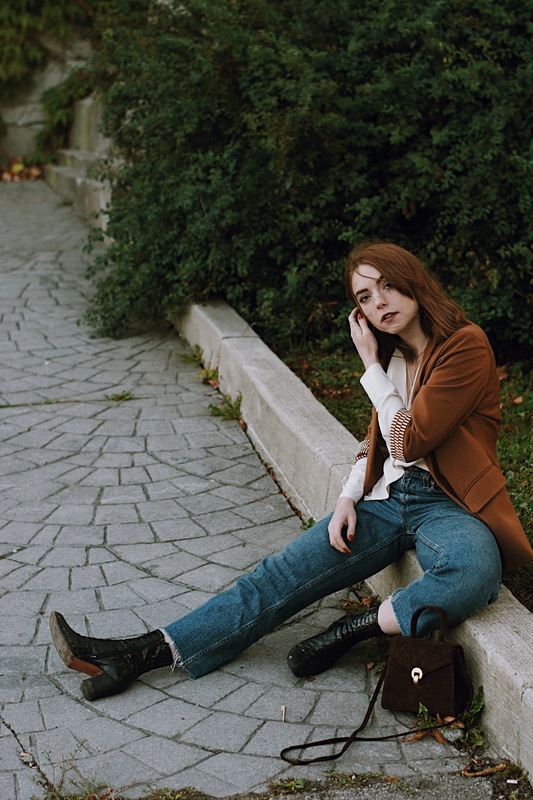 This is my fav style blog by far! oh my goodness. thats such a lovely thing to say! I am def staying with ya’ll. dont worry!